California U.S. Senate Democratic candidate California Attorney General Kamala Harris, left, speaks as Congresswoman Loretta Sanchez, center, listens during a debate. 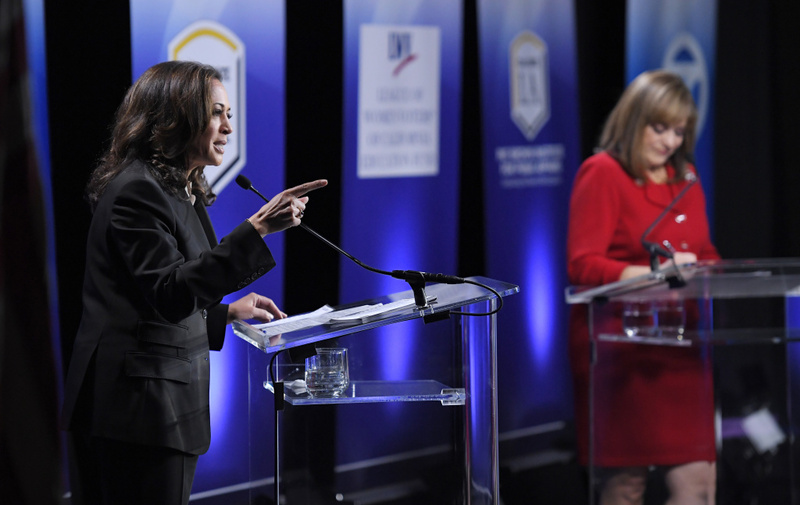 At the one and only debate between the two candidates vying for Barbara Boxer's US Senate seat took place last night at Cal State LA, Loretta Sanchez and Kamala Harris tried to distinguish their differences. It's the first time two CA US Senate candidates from the same party will face each other for the general election. That's the result of CA implementing a top two primary that pairs the two leading vote-getters, regardless of party. Harris is CA's Attorney General. Sanchez represents much of central Orange County in the House of Representatives. Both are Democrats. 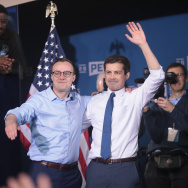 Harris has the Party's official endorsement, as well as those of President Obama and many high-profile Democrats. This morning, she added the backing of both US Senators from CA - the retiring Barbara Boxer and the state's senior Senator, Dianne Feinstein. Larry talks with John Myers and Marisa Lagos about the takeaways from last night’s debate.